Courtesy photo Uppver Valley Medical Center (UVMC) Board of Directors Chairman Steve K. Staley (left) and UVMC President Tom Parker (right) present city of Piqua Mayor Kazy Hinds with their commitment of $280,000 to the Lock 9 Park improvement project during the Piqua City Commission meeting on March 19. 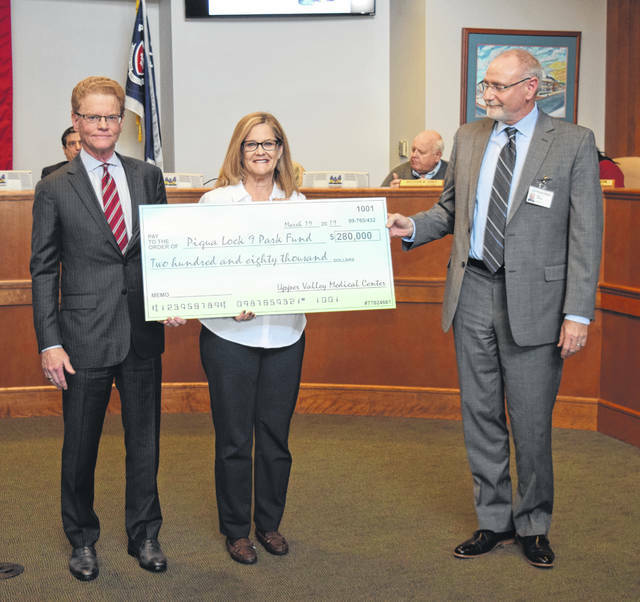 PIQUA — The Upper Valley Medical Center recently pledged $280,000 to the city of Piqua’s Lock 9 Park improvement project. “We recognize there is a link between the health of the community and physical exercise,” Parker said. He went on to say that spaces such as these are ones they want to lean into as they will make the community a place that people will want to work, live, and play. Parker commended the shared vision of the UVMC Board of Directors and the Premier Health Board of Trustees to support projects such as the Lock 9 Park improvement project to invest in community health. UVMC and Premier Health are also continuing to invest in the community in other ways, such as holding a 5k Run/Walk and supporting other health-minded organizations. “We’re everywhere that we can lend a hand,” Parker said. May 4, UVMC will be will be holding a 5K Run/Walk to Fight Hunger at their campus at 3130 N. County Road 25-A north of Troy, the proceeds of which will go to three major food banks in the area. Parker went on to say that UVMC also supports Health Partners Free Clinic, the Miami County Recovery Council, and the Miami County Dental Clinic. “These are like-minded organizations who share a similar mission and passion that align with the Upper Valley Medical Center and Premier Health,” Parker said. Parker and UVMC Board of Directors Chairman Steve K. Staley first announced the $280,000 pledge during the last Piqua City Commission meeting. During that meeting, Parker said that they were impressed with the project and wanted to demonstrate their commitment to working with the city on this project. Staley said that he applauded the city for putting this project in motion along with Parker and the administration at UVMC and Premier Health for seeing the benefit of supporting this project. “I believe Lock 9 Park puts an exclamation point on Piqua,” Staley said. The origins of the Lock 9 Park improvment project are based in the 2007 Plan-It Piqua plans and the Redo Piqua documents that named the riverfront as an area targeted for redevelopment and improvement. In July 2015, the city demolished a building located at 117 E. Water St. next to Lock 9 Park to extend the size of the park and create an open vision for the park as part of the Downtown Riverfront Redevelopment Project. The Piqua City Commission officially approved the redesign of Lock 9 Park during a meeting in September 2016 when they approved a contract with Gamble Associates Architecture and Urban Planning for design services for the project, which completed the initial phase of the design development process for the redevelopment of that area on the riverfront. City officials previously described the goal of redesigning Lock 9 Park as to provide a quality place for residents to enjoy, for events to be held, and for people outside of the city to visit. The hope is that it will increase the quality of life for residents and drive economic tourism as well as private investment in the area, such as finding developers for the Zollinger and old Mo’s Lounge buildings. The city is currently in the process of relocating utilities in the park. https://www.dailycall.com/wp-content/uploads/sites/30/2019/03/web1_UVMC-pledges-funds-to-Lock-9-park-2.jpgCourtesy photo Uppver Valley Medical Center (UVMC) Board of Directors Chairman Steve K. Staley (left) and UVMC President Tom Parker (right) present city of Piqua Mayor Kazy Hinds with their commitment of $280,000 to the Lock 9 Park improvement project during the Piqua City Commission meeting on March 19.